Dark times atop of Black Mountain! 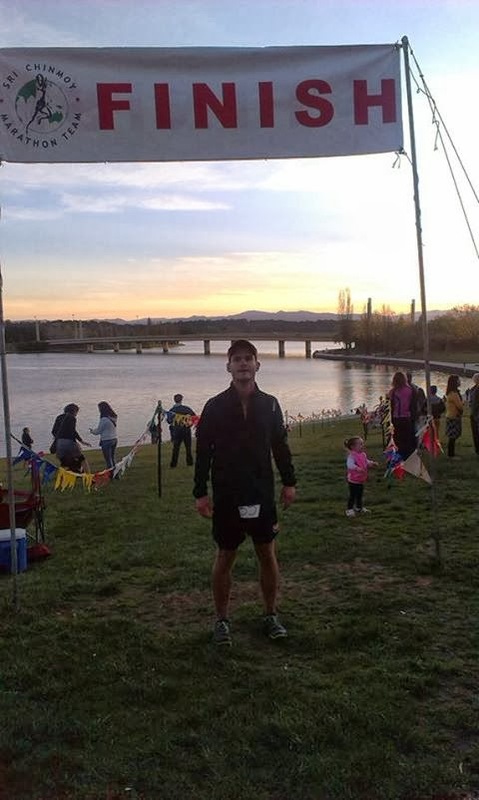 5.40pm on Saturday 21st September 2013 I crossed the line after running 100km in the Sri Chinmoy Canberra Centenary 100km Trail Run. That moment is one I will always remember and take with me into the future. In 11 hours 39 minutes and 42 seconds I experienced highs, lows and personal battles that I had not previously experienced in any way whilst competing in any sport. Ultimately while my performance fell away at stages I walked away satisfied and proud of my first ever 100km race. Rewind! - Kellie and I arrived in Canberra armed with a GPS and the race directors briefing notes where we started our recon of the checkpoints in preparation for the following day. It became apparent at this point that the summits were going to be relentless throughout the 100km as the mountains dwarfed their surrounds. From here we made our way to Kellie’s cousin Mat and his wife Claire’s house who kindly hosted us for the weekend. I then went over to the registration dinner in Dickson and the reality of what was ahead of me was really starting to sink in. That night I began to show the usual nervous behaviour but managed to get a good 6 hours sleep. When we arrived at Lake Burleigh Griffin I checked in and readied myself for the start at 6am. Some last minute chatter with other runners, novelty photos and embrace with Kel was followed by race briefing and a low key start. We were off on my first 100km journey! The first leg was largely uneventful. I began running with Paul Cuthbert, which was great because he knew where he was going and I didn’t. We were shortly after joined by Tom and Damo at the base of Red Hill, the first of the 3 climbs within that stage. Throughout we exchanged positions and I ran very conservatively to my plan. As we approached Mt Taylor I was climbing strongly and feeling good. On the decent towards CP1 I again ran carefully on the steep fire trail saving my legs for the last 30km. I arrived at CP1 in the lead group and met Kel for a very fast bottle changeover and off I went. Paul and I approaching Parliament House about 2km in. At the start of this leg, Paul, Tom and I had put some time into Damo and we were running quite well up to the next climb Mt Arawang. We all climbed together, however, on the descent Tom managed to gain a small lead. During the next 10km we ran toward Mt Stromlo within close proximity of each other. 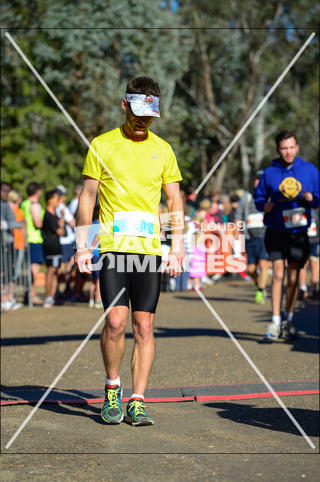 It was about this point that I had a brief moment where I dropped my pace and Paul and Tom managed to get away from me. 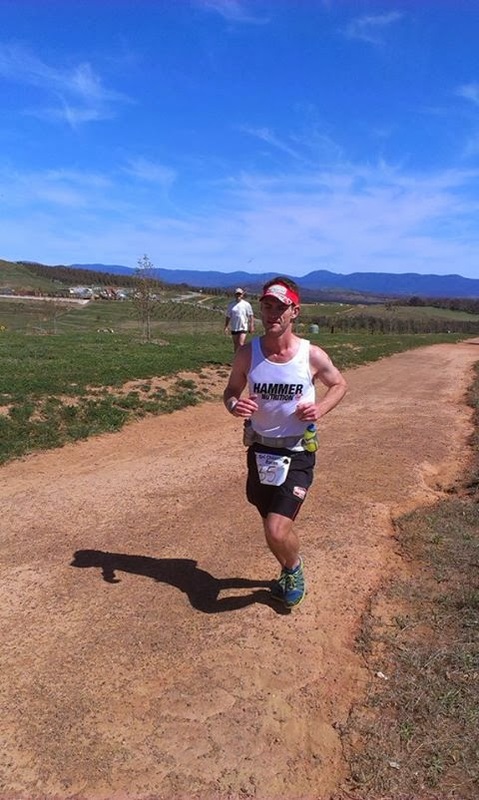 I ran into Stromlo park up Mt Stromlo to the Observatory feeling good. At this point my watch showed 50km which I had covered in 4 hours 42 minutes. It was from this moment I began to struggle to run, it was as though my brain had lost connection with my legs. I wasn’t overly sore or hurting but unable to manage to run and was reduced to walk on parts of the trail that I felt were runnable. The 3km into the Arboretum were slow and painful, when I reached CP2 I felt very much as though I may not be able to finish the race. The time at CP2 was much longer and I used the moment to try and compose my thoughts which were becoming more and more negative. Kellie was concerned but we decided that I should push on taking it easy and walking where I needed to. Approaching CP2 - Bad times ahead! Walking was what I did, about 9km in fact, taking approximately 1 hour 50 mins to get to the summit of Black Mountain. During that time I had been in conversation with Kel on the phone and I was having some serious self doubts about whether I would continue from the next aid station at Black Mountain where Kel was to meet me. I had expected to have bad times, what I did not expect was that they would last the best part of 2 hours, in which I only covered around 12km. I was really struggling to run and walking quite aimlessly when Dave and Andrew came past, they slowed down to see how I was doing. I decided to run with them in an effort to get started again, this lasted about 600m. As they ran away they yelled at me “make it to Dickson” the next checkpoint. As I climbed Black Mountain I had given up, I called Kel to tell her that I would be withdrawing at the next aid station and I let Phil Essam who was marshaling know that I was withdrawing and he contacted the Race Director to advise of my withdrawal. I then casually walked along the beautiful single track that meandered around the mountain towards the next aid station. It was here I met Kel and the battle began! The next 45 minutes involved lots of stubbornness, self doubt, positive reinforcement and discussion about the decision I had made. At that point I had been doing the numbers and knew that it would take me another 7 hours at that pace. I seriously doubted that I could get running again. 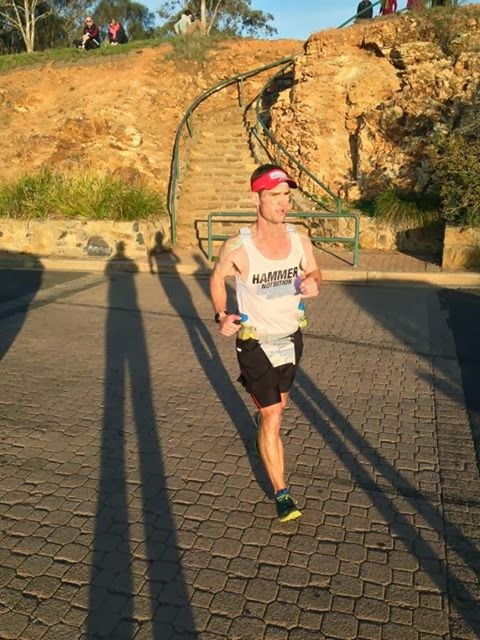 During this time Kel was joined by Sean and Mel and another runner’s wife Rebekah and as a team they began to try and get me back in the race. Kellie had been talking to me for about 20 minutes about how she felt I would regret withdrawing and knew that I could go on. Rebekah came over and assisted Kellie at this point and they both said physically I could continue and that I just needed to get over the mental barrier. They went and got their cars which were full of supplies shortly after Sean and Mel turned up. It was at this point when Sean said that if I was to withdraw from this race that in my next 100km race when the bad times began they would be even harder to overcome. This advice combined with Kellie’s belief in my physical ability and her understanding of me as a person began to eliminate the dark thoughts that clouded my mind at the top of Black Mountain. 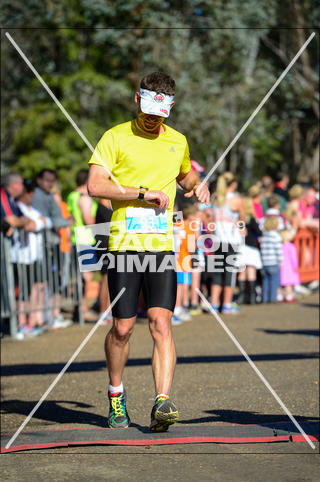 It was also around this point that I went to undo my shoelaces, but I stopped and within 5 minutes was kitted back up, had re-entered to race, had my legs rubbed down with Voltaren and was asked by Kellie to give her 5km to the next drink station. I replied if I am going to start running again you might as well meet me at Dickson which was about another 14km on. I gave Kel who now had a huge smile on her face a kiss, then stepped out and nearly got run over by a car almost giving her and Rebekah a heart attack! As I made my way off Black Mountain I was running freely and felt great, I started overtaking other runners and by the next aid station I was moving freely again. From that point my mental state was reflective of all the positive things that my crew had said and done at the top of that Bloody mountain! The plan began to be followed again, running the flats, hiking the steep ups and running the downhills, holding consistent and steady splits across to Checkpoint 3. CP3 a much better stop. I approached this checkpoint, tired, but no more tired than I had expected, it was my mind that had returned. At that aid station it was business as usual, Kel had my things together and we briefly chatted. Kel, Sean and Mel encouraged me to keep it up. I started on the approach to Mt Madjura and Mt Ainsley knowing that I had run about 10km of the same trail earlier in the year. I was running the way I had planned and upon reaching the base of Mt Madjura I began hiking purposefully, passing many but only being overtaken by a few of the relay runners. At the top of Mt Madjura, the highest point of the day, I knew I would finish and was confident that I would do so strongly. I ran the descents well and was rattling off the km’s overtaking tiring runners who were reduced to the same state that I had been in 30km earlier. At the base of Mt Ainsley I knew that after 1 more climb it would be a downhill run to the finish. On the climb up Mt Ainsley I was able to run significant parts of the steep ascent, giving big bursts followed by shorter walking breaks in the last 700m before the summit. At the summit I was greeted by an excited and massively supportive crew who I challenged to a race to the finish. This race was briefly disrupted by the idiot who had removed the course markings, causing me to take the wrong trail for 150m or so. On the steep and stair filled downhill off the last mountain, I was running as though I had stolen something! The majority of the course markings had been removed which would prove to be very difficult for the runners coming through at night. It is disappointing that people feel that they need to interfere for no apparent reason. As this descent was quite steep, I was being very careful, however as it flattened out towards the War Memorial I began to run quicker enjoying the soft grass underfoot that led towards Lake Burleigh Griffin. During this time I reflected on what had occurred and was satisfied that whilst I had had a bad period in the middle of the race, I had mostly run according to plan and was about to achieve my goal of completing a 100km run. When I got onto the path that led towards the finish I noticed 2 runners in front of me, the competitor inside me urged me to pass them, I did so completing that last 5km in 25 minutes. As I turned up the steep bank, yes, an uphill finish! 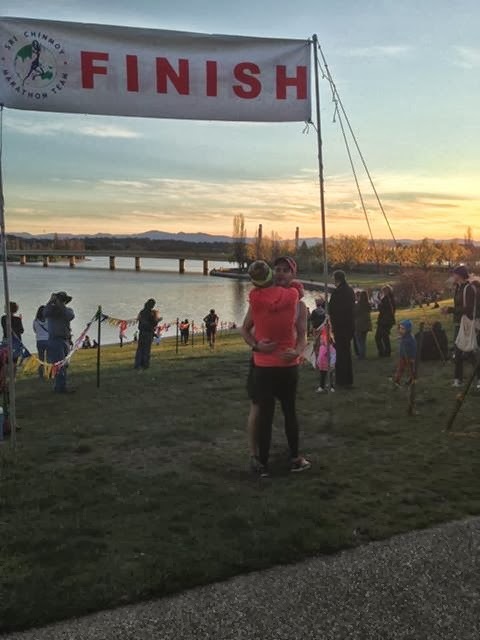 I noticed I wasn’t the only one bolting towards the finish as it turns out Kellie and I had a tie in our race from Mt Ainsley to the finish, she unfortunately had to park about 1km from the finish line and bolt whilst carrying all my gear to the end. Nonetheless she made it to the end and so did I, that moment where I hugged Kellie is one I will remember for the rest of my life. 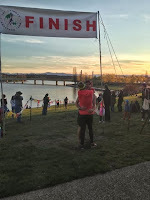 While I was immensely relieved to cross the finish I was also indebted to those I had shared that moment with. If it wasn’t for Kellie who has always supported me and was my rock on the day, Sean and Mel of MountainSports who have been supporting me sincerely since the start of the year and our new friend Rebekah Markey I still would have been on top of Black Mountain all dressed up with nowhere to run. 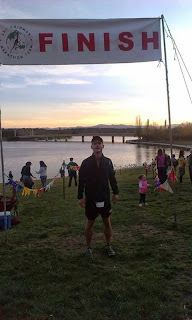 I had finished 100km in 11 hours 39 minutes coming in 8th male home. In 100km I had experienced a lot but in the short time since the race I have also realised a lot. I know I have a long way to go, my mind can be both strong and weak (of which is my choice), that running 100km is hard but rewarding, that ‘racing’ 100km will be even harder, that I have an amazing wife who will support me no matter how crazy my idea seems to be, that I have gained true friends in Sean and Mel and that with people like Rebekah in trail running, it will continue to be the best sport I have been involved in. I would like to thank Hammer Nutrition for providing me with the opportunity to run my first 100km race. Hammer Nutrition are very supportive of trail running and very generous when it comes to supporting both runners and events alike. 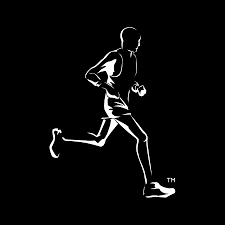 I would love to have the opportunity to work with Hammer again and will continue to use their products as long as I keep on running. With this in mind my focus now turns to my recovery and preparation for the Kanangra 50km Trail Ultra on the 19th October. This event was my first ever Ultra in 2012 and has been my main motivation throughout 2013. And after Saturday I will be using my newly acquired experience to ensure that I perform well there. My goal is sub 4 hours for the 50km, a big ask but a question I am willing to ask of myself. Gear - Inov8 Trailroc 245, Garmin 110 and 610, Hammer Race Ready Singlet and Shorts, Hammer Headsweats Visor, Nathan 4 Bottle Belt and Dual SpiBelt. Nutrition - Hammer Perpetuem Caffe Latte 6 to 7 Scoops, 3 Espresso Gels, 2 Montana Huckle Berry Gels, 1/2 a scoop of Heed at each CP and loads of Endurolytes. I also had some pasta and Coke when I was at the Black Mountain Aid Station. I have had plenty of Recoverite in the days since. The organisors of the event should be proud of their efforts, it was well marked, the aid stations stocked and manned well and the support on the course very uplifting, making it an enjoyed and fun day. A special mention must go to my coach and friend, Brendan Davies, who has been a major part in getting me to where I am today. 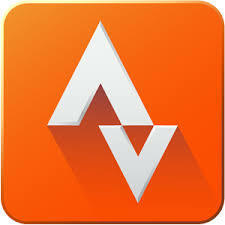 On Saturday the 21st of September I will be attempting my debut 100km race. This is a major milestone for me as a runner and will give me an insight of myself not yet seen. Is see the challenge as a stepping stone to my greater goals, running the TNF100 and completing a 100 mile race. But for now it is Canberra and the Sri Chinmoy race that is also on debut. 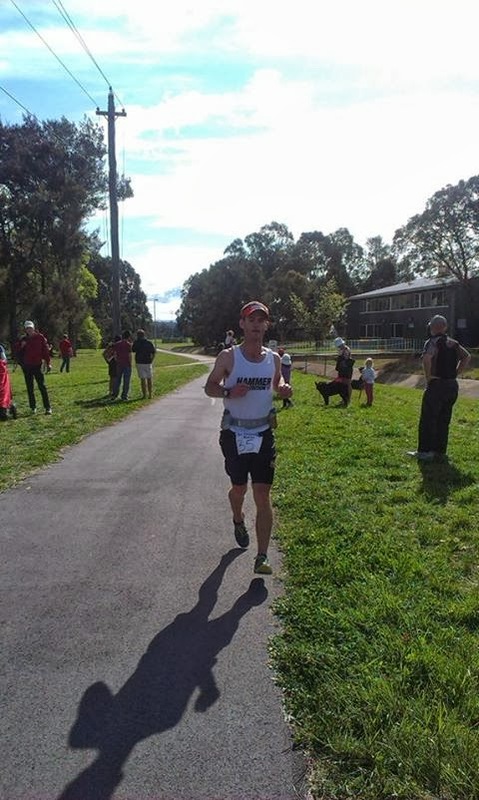 I have been preparing for the Kanangra Trail 50km event in October so I am conditioned to run long distances, averaging well over 100km and 8hrs of running each week. I have been focusing on speed a bit of late but have still knocked out several 40km+ runs, with my big few weeks occurring 10 weeks before the event, proving to be a lucky coincidence. I have been a little sick and found that my chest infection from late Winter has lead to a temporary case of exercise induced asthma, which explains my persistent cough, that should pass. I also found that my heart was very strong and my blood pressure 118 over 68 with a hr of 58, so I can say I have a clean bill of health. 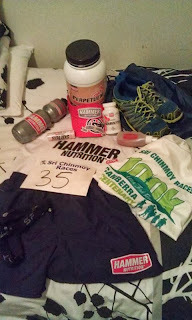 The opportunity to compete in the race came from Hammer Nutrition, I have been given an entry and will use this opportunity to see what I have when it comes to the long stuff. I am pleased to be working with Hammer at this race as I have been using their products successfully all year and believe strongly in both their products and the company. I hope that this may lead to further opportunities to work with them in the future. I will travel down on Friday with Kel, who will be my support and pacer(if needed) during the race. I am so lucky that she will be with me on the day and I know her support will be massive. I hope to do her proud and trust her judgement when it comes to on the go decision making that maybe required. Start slow and build as the race progresses. Run the flats, hike the steep ups and carefully run the downs. 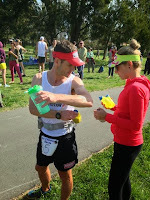 Drink regularly and use a sponge at aid stations. Don't race, this is a challenge for me, I only want to finish. Time goals are not being set, only time guidelines for checkpoints. Stick to my plan, don't get carried away and be disciplined. 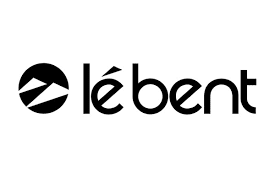 Nutrition - 1 scoop of Caffe Latte Perpetuem per 250ml lasting roughly 90min, 1 Endurolyte every 20min, 1-2 Perpetuem solids every hour, half a Espresso Gel (may switch to Montana Huckleberry for leg 3) every 30min or so. At aid stations I will have around half a scoop of Heed to 300ml of water and some Coke. Gear - Inov8 Trailroc 245, Injinji No Show Socks, Nathan 4 Bottle Fuel Belt, Garmin 610, Pink Garmin 110 (thanks Kel) and Dual Spi Belt. 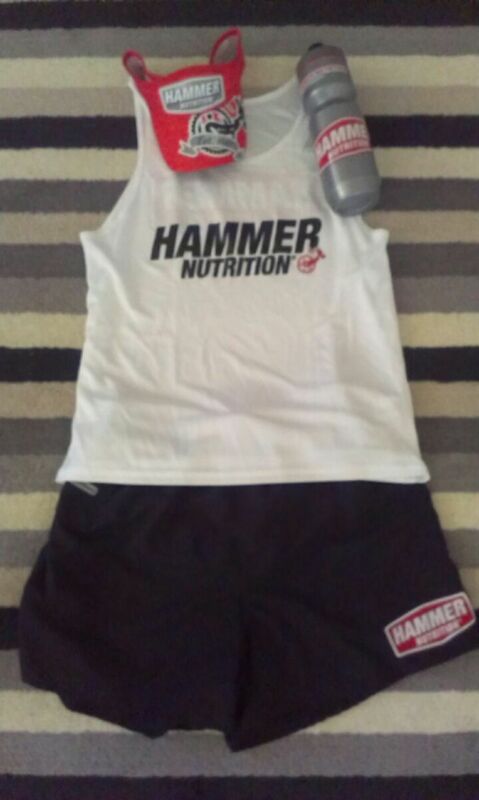 Hammer have also been kind enough to provide a visor, singlet and shorts for race day. 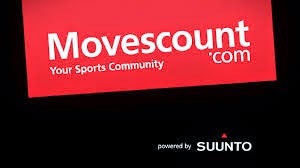 In just over a week and I'll embark on my first 100km run, I'm pretty excited and keen to see how I go. Also something big happened for me last week and was announced yesterday, the Buffalo Stampede. I'm lucky enough to be part of the Mountain Sports Team for this amazing event in 2014. I can't wait to get stuck into training and test myself against the mountains. 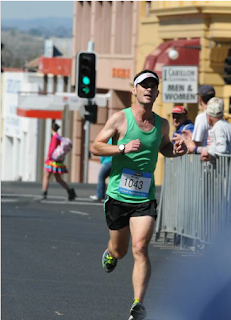 I went over to Dubbo for the Stampede Half Marathon on Father's Day weekend. We travelled up on the Saturday morning and visited the zoo that afternoon. I had a good time with Kel and the boys and my parents arrived in the evening in time for us to venture out to dinner. The Sunday morning dawned and it was time to head over to the zoo for the start. I was hoping of running well but the signs had been there all week that it was going to be a battle. I was still recovering from Mudgee the week before, I felt sick and was unable to train well in the week leading up to Dubbo. I was hoping for a 77min time but really was hoping for sub 80min, this I felt was achievable. In what was a fast field I settled into the front of the start and waited for the gun. Off we went and out the gate of the zoo, I sat in about 7th or so and felt comfortable at a quickish pace. 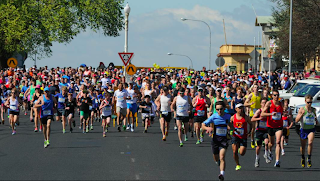 I was aware there was an issue after 3km or so, I couldn't maintain a steady pace and was all over the place mentally, it was going to be a stretch to finish strongly. I think at 37min I had run 10km and was really struggling, it was as though I couldn't get out of third gear and had to back off every time I went a little faster. This feeling stayed with me until the end, every little incline, and I highlight the little, felt terrible and when ever I attempted to push on I had to recover shortly after. I entered back into the zoo and was really struggling, being passed easily and generally feeling quite dejected. I was in pain and for the first part of the last 5km loop of the zoo I just ran aimlessly until a group of 10km runners who were battling for positions came up on me. I switched back into gear and basically fartleked my way to the end pushing 400-500m then recovering for a while, this was tough but I nearly caught the two runners in front of me as a result. I had stopped checking my watch a while back and when I hit the line it read a very disappointing 82.20. Well below par and a sign of overreaching that gives me plenty to think about in the future when it comes to racing and training. I came 13th and was really disappointed with how it went, but in the end thats all I had in me and I did my best, bad results come with good results, thats why its a competition. Kel ran in feeling much the same, she had struggled after a brilliant weekend at Mudgee the week before and ultimately we both took a lot from our toughest and what felt like our longest half marathons. Luckily for us it was Fathers Day and we had the boys to take our mind from the mornings run. We finished off the parts of the zoo we hadn't seen yesterday and had an ice cream with the boys and my parents before heading back home. I will be back for this one, it was a beautiful course and great atmosphere, it also becomes the redemption race similar to the Glow Worm Half of 2012. I believe a picture tells a thousands words, and I also believe without disappointment happiness would not be as profound. My local event and a welcome sleep in on race day, while not a realistic chance or winning I place a considerable amount of importance on this race. 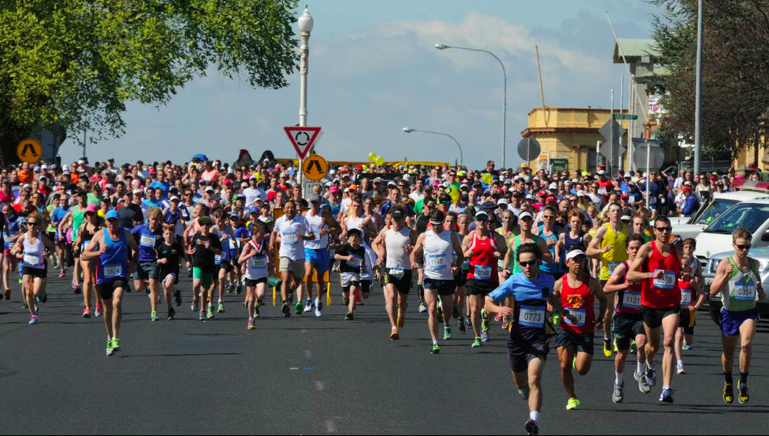 It always has around 1500 entrants and is a real community fun run. Sunday was my third attempt in what was my first ever race, I was aiming for a PB, down grading from a sub 26min time after my prolonged recovery from Mudgee, and finishing as highly as possible, top 10 with a chance of a top 5 depending on who showed up. Race morning was relaxed, I had a hot bath and stretch then made my way to the start area on Kings Parade. I was able to knock out a very decent warmup and was throughly ready, confident my legs had a quick 7.5km in them. 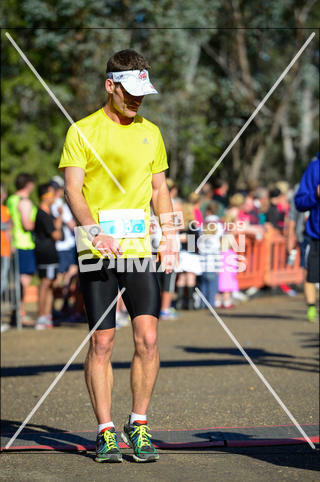 As it was hot it was a race for a spot not a time, my goal was to run well and finish strongly. The start line is always a mess, kids as young a 6 lining up with the faster adults is always a recipe for disaster, hopefully one day they sort this out as someone will get hurt as the numbers grow. So I lined up around the middle and we were started on our way, there was a little push and shove but I managed to get a clear run after about 20m or so. The first few blocks is always a mad rush and I was aiming to be conservative, but I was running way too fast so I backed it off and settled into my race. I was running in a small group, I wasn't really paying attention to who but was aware I was in a race with Nic Zawadski and a few other locals. I was feeling good and ran a solid pace up the first two hills and pushed hard on the descents, my flat speed was far more balanced so I was happy. I wasn't in the same league as the leaders, but I was much closer than in previous years so all is pointing towards a podium in the future if I continue to improve. It wasn't until around 2km to go I started to test the waters around me. I had ran relatively intrinsically until that point and was now seeing what others had in response to changes in pace, hills and so on. Coming into the last long downhill I gave two surges, the second was before the turn into Seymour St. lasting for far longer. I put it out there then, I went to the front of the group and pushed on, by listening to the other runners footsteps I could tell I was starting to open a gap. At the turn into the finish straight I couldn't hear anyone behind me and I knew I had to hold on with a tough uphill finish coming up. I ran past the usual St Pats Hockey crowd at the Family Hotel, they were celebrating a comp win, and give all runners an encouraging cheer. I was not only holding my spot but catching 5th and 4th respectively, I closed the gap on the female winner to only 20sec which at times had gotten out to 1min or so. 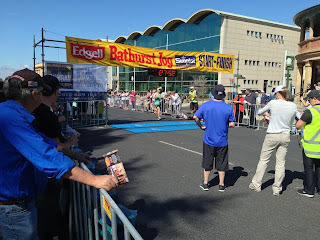 I gave another surge and ran into the finish line strongly, crossing in 27.52, 6th overall and 5th male, all goals achieved with the bonus of being 1st Bathurst local home giving me the half/jog double for 2013. My finish captured by Sean of Mountain Sports, who travelled up with Mel, promoting the Lithgow Tri and offering their support on the day. Thanks guys! I waited to see Kel come across the line 33min, a new PB and 5th place overall in the women's field. She had also crossed as 3rd Bathurst Female and run a strong race taking over 3min of her time from last year. Our combined results also gave us the Husband and Wife prize for the second year running so we were very pleased with how the day went. It was a good morning especially after the disappointing trip to Dubbo 7 days before. With the Jog done and dusted it is now onto the Sri Chinoy Canberrra 100km event on the 21 September. I'm on full taper and will be running short meaningful sessions, reading up on running and preparing for a new year once Canberra and Kanangra are finished. I plan on training and developing further over the Summer, working to a thoughtful plan using my past experiences to improve my running.